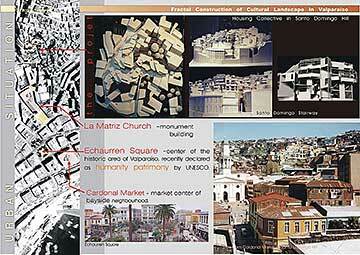 This is an urban recovery project for a sector with patrimonial value from the city of Valparaíso. 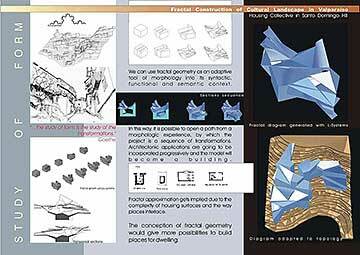 In order to bring in its cultural landscape, we have proposed a study using fractal diagrams. 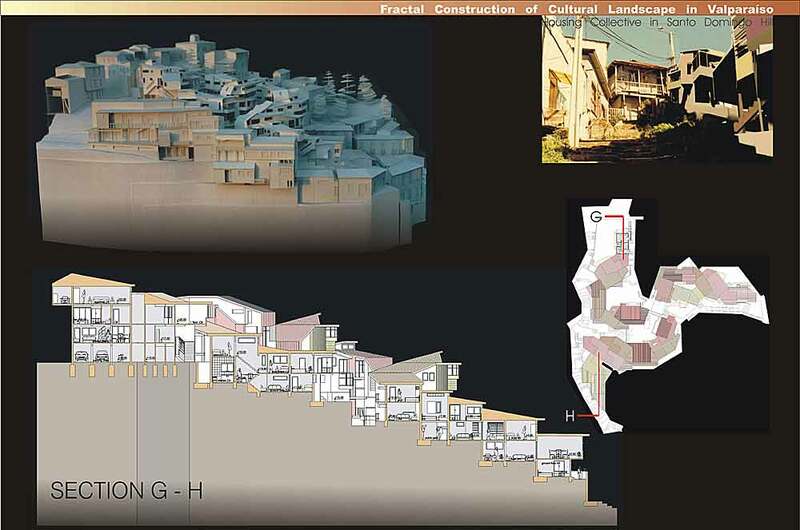 This strategy makes possible not only to adapt to a complex and irregular morphology, but also it integrates conditions, such as coupling to the existing urban pedestrian scheme, interlacement between the housing network and public ways, construction of places for common use and neighbourhoods, and recovery of places inherent to a spontaneous character architecture observed in the hills, including lookouts, vertical yards, galleries and balconies. This project is a low cost housing collective of middle high with 28 stepped apartments, composed by buildings of reinforced concrete wall supporting structure, secondary metal frames and plate coatings of aluminum and zinc. 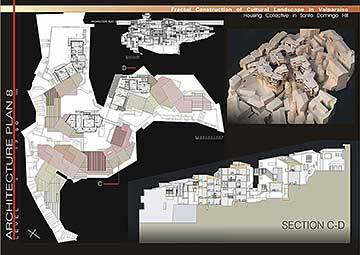 The project corresponds to a group of degree projects where the emphasis was put on architectonic design process. 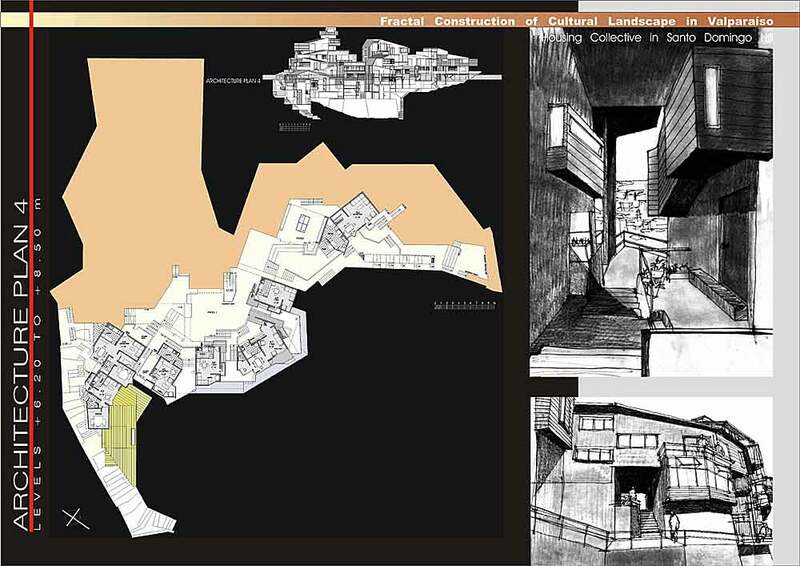 It is intended to incorporate contemporaneous thought matters and link them to creative process of space in architecture. 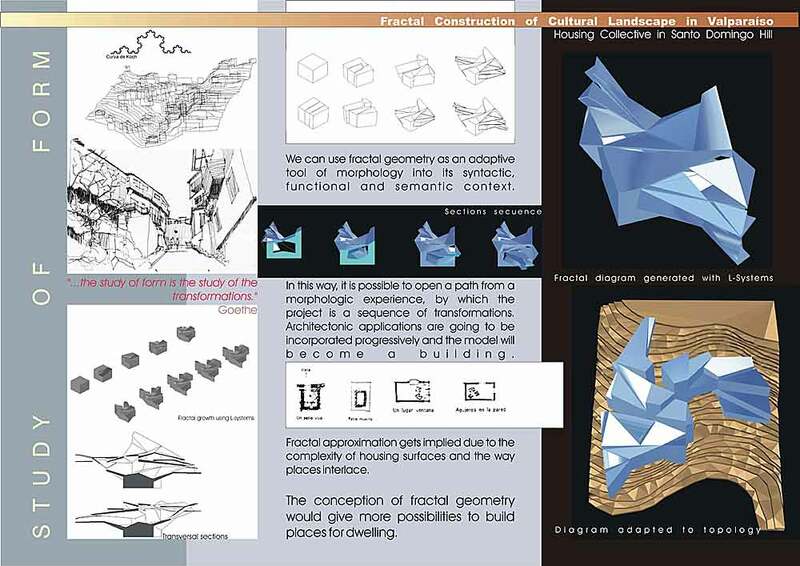 The workgroup proposed that buildings should reflect their own culture and be developed with common technologies. 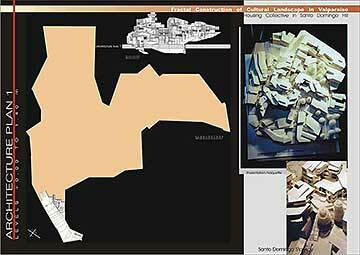 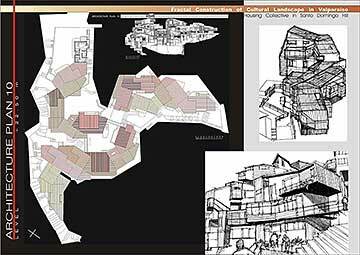 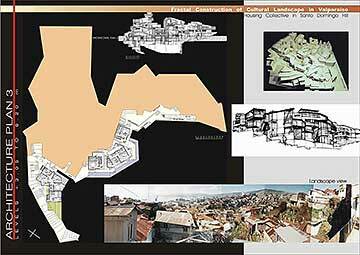 Fractal geometry was used as an investigation about the spaces with architectonic content of old houses in the city of Valparaíso. 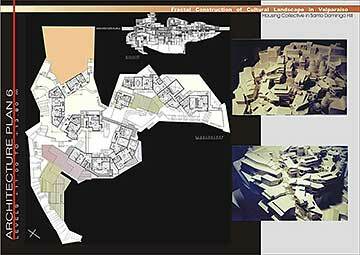 The goal of the project was to develop a renewing project of an old area of the city, where plot of narrow streets and stairways generates a complex geometry. The project corresponds to low cost housing with a kind of space organization which enables a strong social interaction. 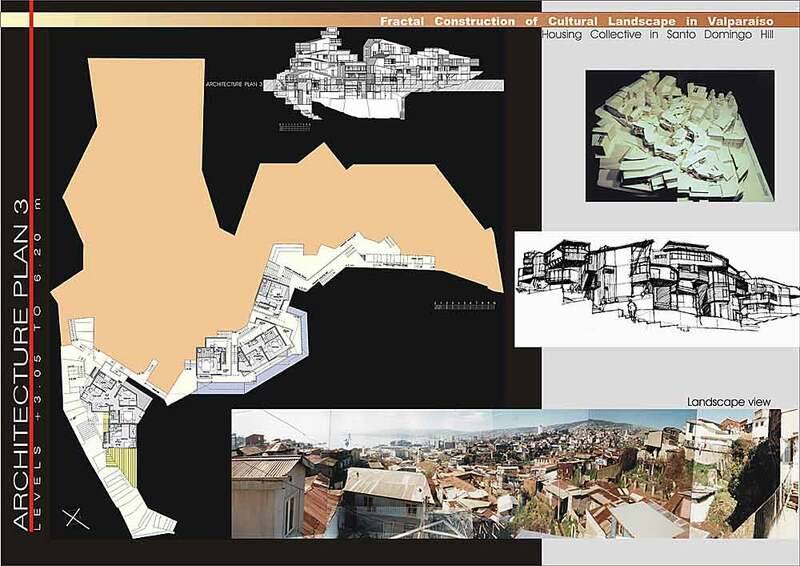 Project presentation. 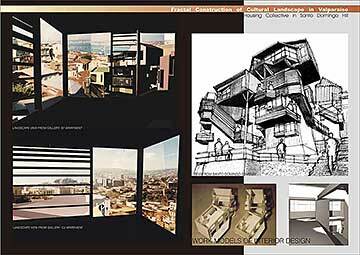 Maquette and stairway photo. 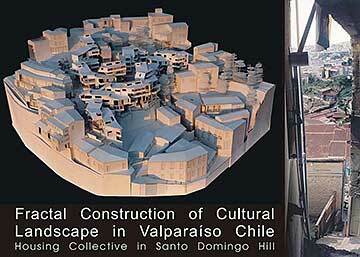 Cultural landscape of the hills. 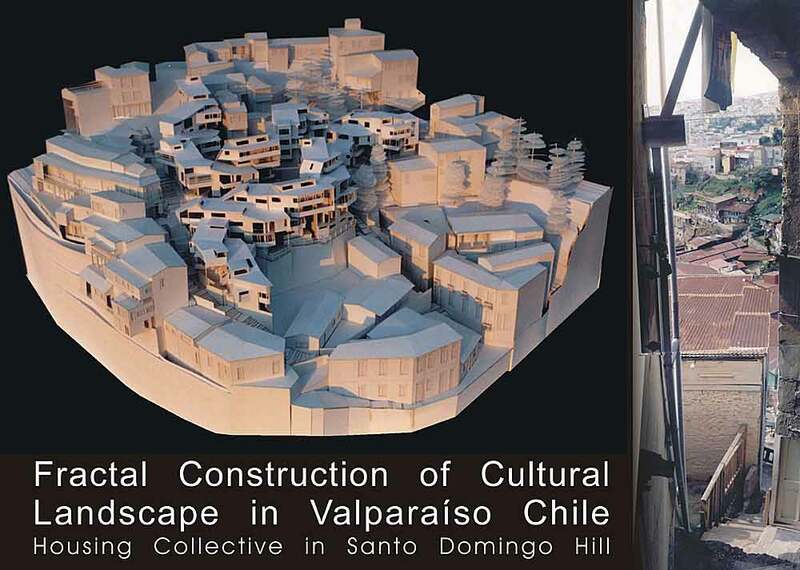 Photo and drawings of Valparaiso´s houses.We found the way of living particular to the hills; neighbourhoods, passages and small squares where social contact is made, including neighbourhood boards, sport and clubs. 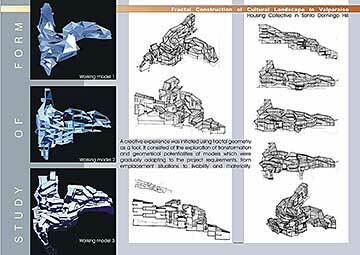 Study of form. 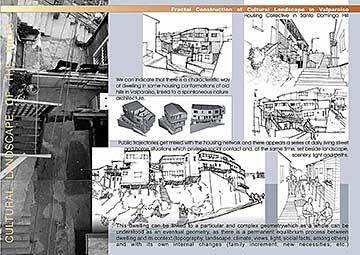 Drawings and work diagrams.The specific program is housing collective –according to the place purpose and to the dwelling thematic-, where habitability was gradually developed from a model of fractal growth in the area. 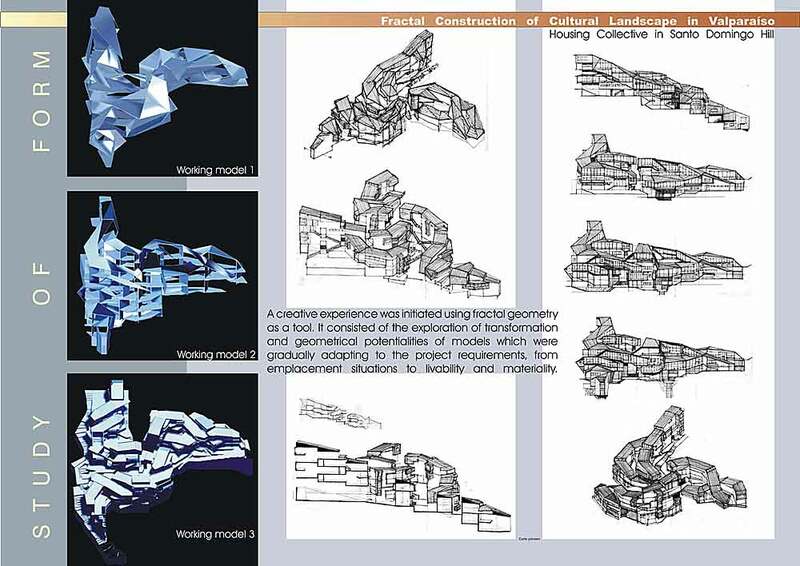 Study of form 2: Drawings and work diagrams of project.The possibility of experimentation, is not excluding the contents and meanings of an architectural work, enabling to maximize the design of an unsuspected variety of architectural spaces. 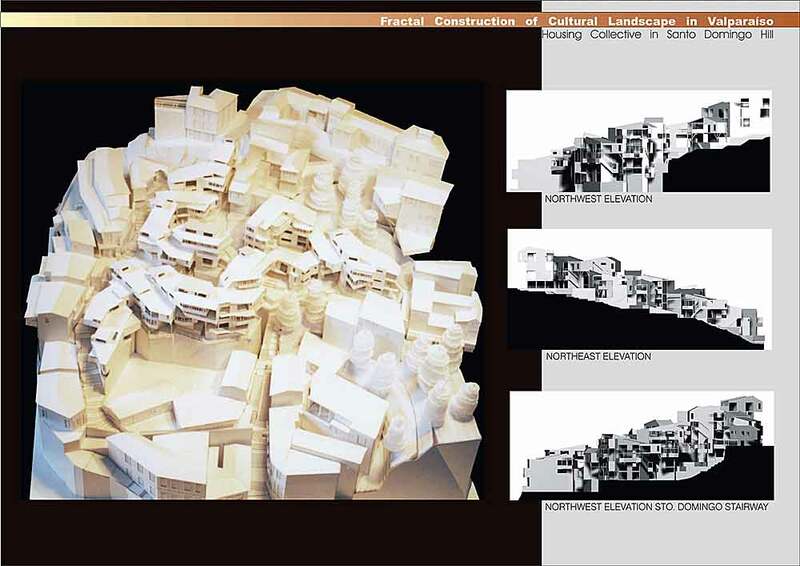 Urban situation. 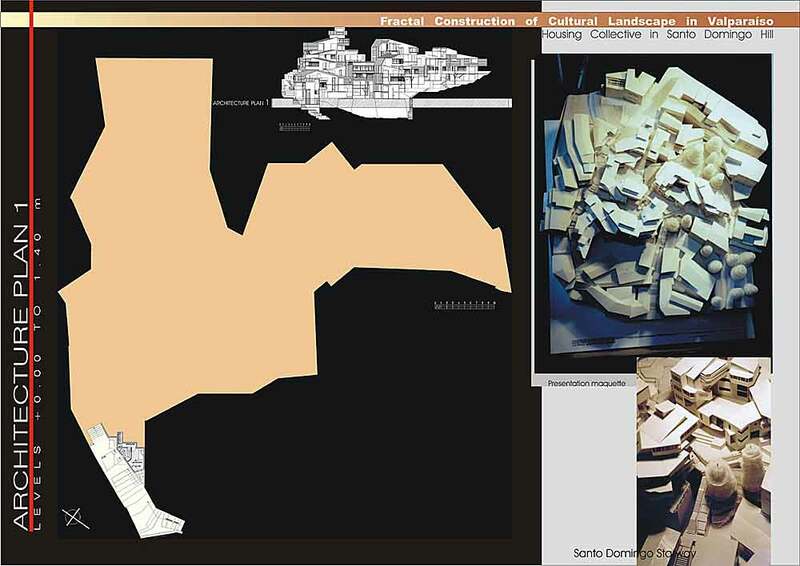 Aerial view, maquette photos and enviroment photos. This sector is located inside the section for urban recovery of the Matrix Axis, beside the historic area of Valparaíso, recently declared as humanity patrimony by UNESCO. 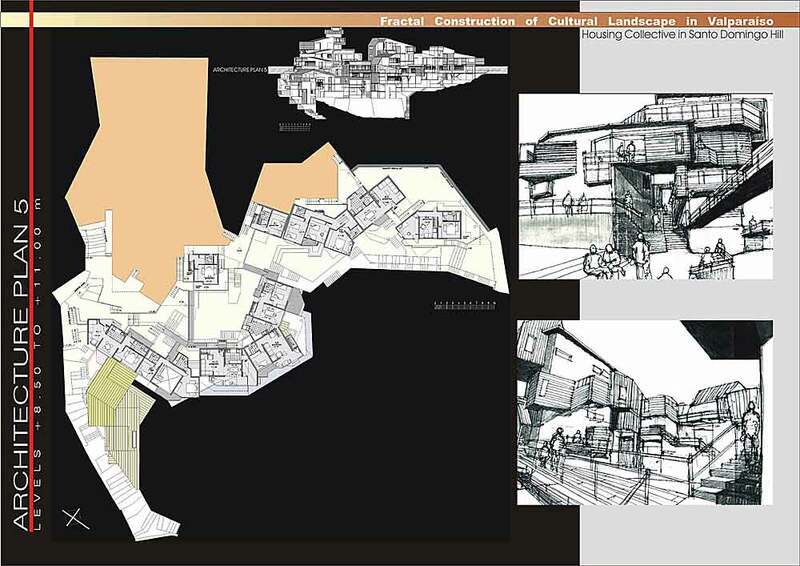 Housing collective. Patio in Santo Domingo Hill and drawings of enviroment and project. We pretend to rescue the neighbourhood sense and recover space values of the hill. 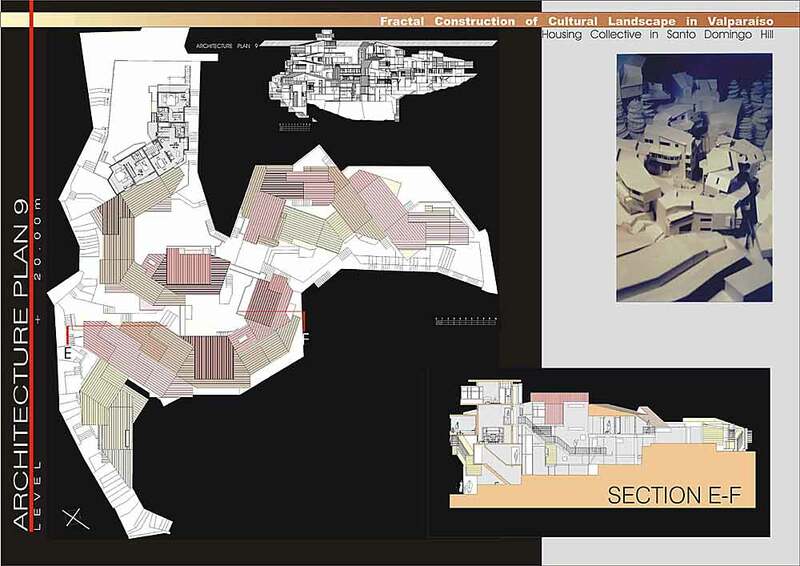 Architectural plan 1, photos and drawings.The proposed houses are classified in three categories : 100 m2 apartments, for big families; 75 m2 apartments for smaller families, and 45 m2 apartments for young couples with a more temporary stay. 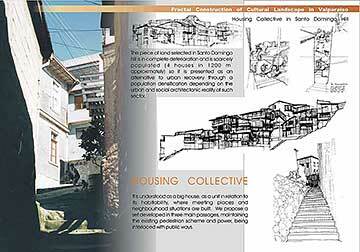 Architectural plan 2, photos and drawings.The project will be incorporated to the neighbourhood, creating places which promote the space with the adjacent constructions, giving rise to small yards. Architectural plan 3, photos and drawings. 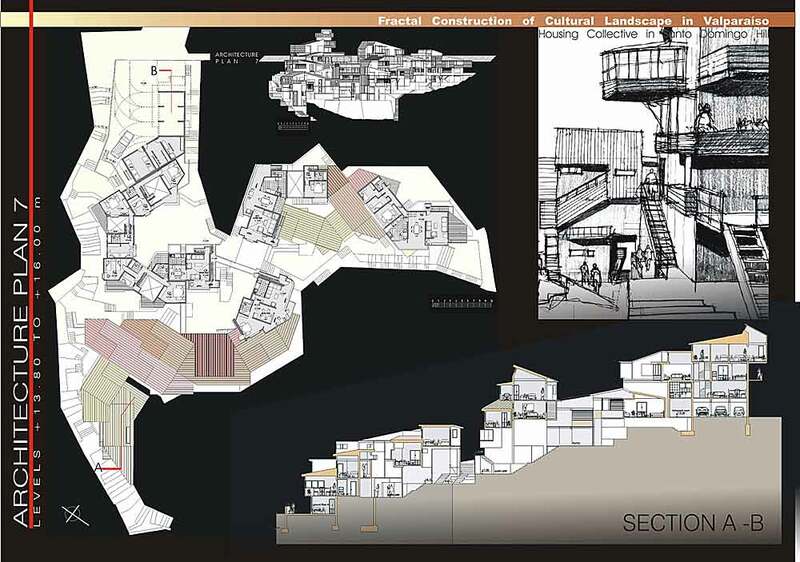 Architectural plan 4, photos and drawings.The places appear in meeting and branching areas and are oriented to interior views of the set and pregnant views of the landscape. Architectural plan 5, photos and drawings. People would be able to walk through alleys and bridges, and privilege would be held by small places in the entire boundary, not only for common use, but also collective. 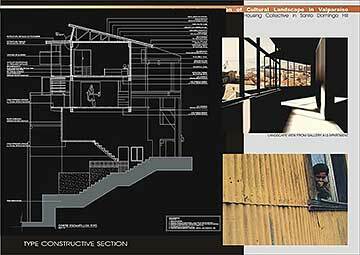 Architectural plan 6, photos and drawings. Architectural plan 8, section C-D, photos and drawings. 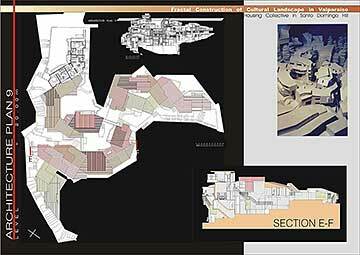 Architectural plan 9, section E-F,photos and drawings. section G-H, photos and drawings. 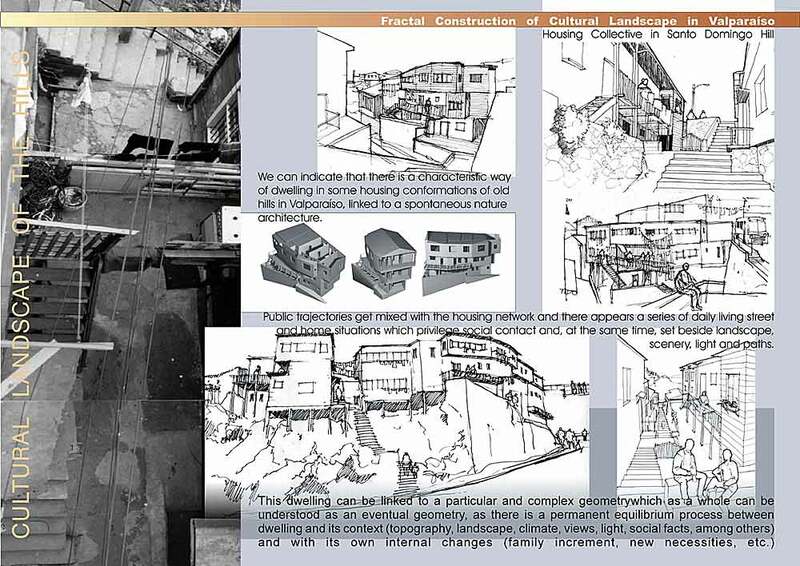 As a particular form of dwelling, a "roof cascade" is produced, which together create a stepped set of households. Lanscape views from gallerys, and drawing from stairway.The dwelling will emerge in its vertical yards, galleries, balconies and socles, made up of secondary structures which transcribe the geometry of an angular supporting structure. Constructive section, landscape view from gallery, and exterior walls materality photo.The apartments are like boxes so that the user is able to configure and modify internal spaces. Maquette photo and elevations of project.